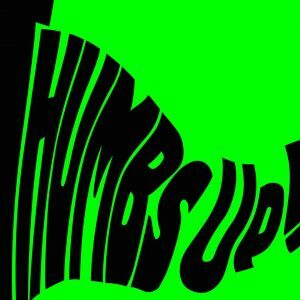 Pentagon's "Naughty Boy" Fails to Outshine "Shine"
Amidst Hyuna and E’Dawn’s dating scandal and the subsequent controversy surrounding Cube Entertainment’s handling of the situation, the remaining members of Pentagon have put on a brave face and returned with their new mini-album, “Thumbs Up!”, promoting it with the title track, “Naughty Boy”. After the viral success of Pentagon’s career-defining single, “Shine” (the YouTube views on which exceed their previous MVs by about 70 million), they were faced with the pressure of coming up with something that wouldn’t disappoint their suddenly large and expectant audience. Composed by Flow Blow and members E’Dawn and Hui, “Naughty Boy” is a decent attempt at this, replicating the youthful and mischievous energy that made “Shine” shine without sounding like a rehash of it. 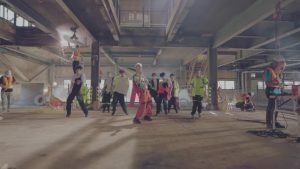 Still, there’s a reason why “Shine” captured the K-pop fandom’s attention and “Naughty Boy” doesn’t quite have the same effect; one reason is the painfully obvious absence of rapper E’Dawn (and to a lesser extent sub-vocalist Yanan), but overall “Naughty Boy” is just not as catchy or cohesive. The lyrics also suggest rebelliousness against older generations in Korea, purposely going against the system and refusing to conform with lyrics that are intentionally nonsensical – such as singing “do re mi fa so la ti do” backwards – or which outright rebel, telling older generations to just “go eat chicken” instead of forcing them to be like robots. 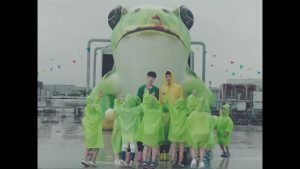 The music video reflects the frog theme, showcasing their frog-themed choreography and throwing in some kids in frog costumes for good measure. Aside from this, they also appear as normal workers in a range of unremarkable settings, from construction workers in a half-finished building to packing boxes in the back of a lorry. A quote suggests the reason: “The reason I kneeled down was to get ready for a leap”. It seems they play the role of normal people in low-paying jobs, “kneeling” down before they “leap” and achieve greater things. Visually, the MV follows the style used in “Shine”, with an emphasis on everyday surroundings and fun, trend-inspired choreography. The props and costumes feature bold colours, but the low contrast on the video dulls the overall colour palette for a more understated effect. While the opposite would have worked well for such a playful song, the colours combined with the unglamorous settings – buildings in construction, grey skies and shipping containers – ground the video in reality, emphasising the more serious side of the lyrics and showcasing real Korean places and people. Overall, “Naughty Boy” is a commendable attempt at following up the success of a viral hit while maintaining some artistic integrity. The song is fun and easy to sing along to, but it also hides a more sensitive melancholic side, reflected musically in the pianos and sentimental chords. In this way it’s refreshingly different to “Shine”, but overall it feels underwhelming in comparison; “Shine” contained catchier melodies and more novelty effect. E’Dawn’s presence is sorely missed; his nasal, whiny high-tone rap contrasted perfectly with Wooseok and Yuto’s deep, gruff voices, completing the age-old formula that has served Bigbang’s G-Dragon and T.O.P and B.A.P’s Zelo and Yongguk so well. Within the ten-member group, E’Dawn, Hui and Wooseok’s voices are by far the most distinctive, and the loss of one pushes Pentagon a step closer to the chasm of “nugudom” that they just climbed out of with the success of “Shine”. Hopefully, they will be able to withstand their controversies and emerge stronger for it – “Shine” showed bundles of potential and it would be a shame for it to go unfulfilled.